The Electric Vehicles – Introduction to Battery Technology will cover basic electrochemistry that occurs in batteries. This course will provide an introduction to batteries that are used in energy storage devices in a wide variety of engineering devices. Learning Objective: Define electrochemistry and identify and explain various aspects of battery cells, battery systems, and battery manufacturing. Learning Objective: Engage with Autonomie, software that is used to simulate Hybrid-Electric vehicles. Learning Objective: Explain how a battery works, describe the basic principles of battery chemistry, and analyze oxidation, reduction, and various losses. Learning Objective: List and explain the various types of batteries, and evaluate dry cells, lean acid, and nickel metal hydride more in depth. Learning Objective: Analyze lithium ion batteries specifically, explain the manufacturing of batteries, and assess how the battery management system’s goal is to optimize the life cycle and safety of batteries. The concept of third-generation biofuels is to cut or eliminate pollutants in the fuel production process. This fuel-switch approach also includes policies to promote electric and hydrogen vehicles, which enable pollutants to be reduced either during manufacture (e.g. in generating electricity at power stations/hydrogen at refineries) or by using renewable sources of energy that produce little pollution at all. The move towards such a fuel-shift strategy thus brings together action to cut transport’s local and global environmental impacts. It is also one that has the potential to link to the powerful political driver of energy security. Although the use of batteries and electric drive in hybrid cars is now mainstream, an entirely electrically powered car requires the storage of large amounts of energy on board the vehicle. One way to do this is, of course, in batteries. Older types of battery electric vehicle (BEV) used lead acid batteries, but most current electric vehicle designs use lithium-ion (Li-Ion) and lithium-polymer (Li-Poly) traction batteries. These have a much higher energy density (100–125 W per kg), providing a significant improvement in driving performance and vehicle range. First-generation electric vehicles used direct current (dc) motors, but more recent cars convert the direct current to alternating current (ac) using an inverter, which then drives an induction motor. These vehicles have increased efficiency, have a higher specific power (per kg) and require less maintenance. Until recently, BEVs were only available in small numbers as variants of ICE cars (e.g. the Peugeot 106 electric car, manufactured from 1995–2003). A dedicated BEV design, the REVA G-Wiz micro car (legally classed as a ‘quadricycle’), was launched in 2001 and has secured a small niche market, selling 4000 vehicles worldwide by 2011. Renault’s recently launched ‘Twizzy’ is also an electric ‘quadricycle’. More significantly, since 2010 a number of dedicated high-performance BEVs have been launched commercially, including the Mitsubishi iMiEV, the electric Smart, Nissan’s Leaf (Figure 14), the Peugeot iOn, Renault’s Fluence and the Teslar Roadstar 210 kph sports car. The Mitsubishi iMiEV EV technology website provides a good overview of key features of modern BEVs; if you wish, you can also follow this link to find BEVs available in the UK. One of the main concerns about BEVs is that they only have about a 160 km (100 mile) range and that in most cases recharging is slow (6–8 hours). They also cost about a third more than a comparable ICE car, although much-reduced running costs counteract the high initial purchase price. The commercial launch of a range of BEV designs is part of a UK government/industry partnership approach that envisages a long-term transition to a low-carbon transport future in which cleaner internal combustion technologies are joined by an initial widespread uptake of battery electric vehicles and then ‘plug-in’ hybrids, followed later by hydrogen fuel cell vehicles (New Automotive Innovation and Growth Team (NAIGT), 2009). Similar programmes have taken place in France, Germany, Spain and the USA. Figure 15 shows the technology uptake ‘roadmap’ from the 2009 NAIGT report. How solid State batteries will change the electric vehicles future? How to select a battery for electric vehicle? What is battery management system and its importance in battery? How to calculate the weight of battery in electric vehicles? Note the extreme complexity, including a traction battery! It is missing a plug to charge the battery from the grid, a PFCEV! 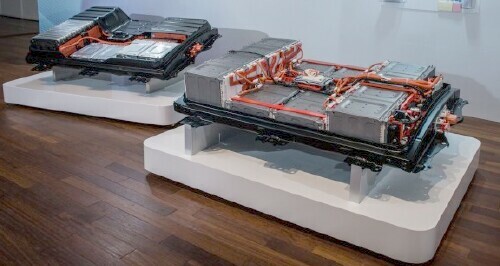 Comparison of Nissan 30-kW (left) & 60-kW (right) batteries. Atom Motors, an Electric Vehicle manufacturing company promoting innovation, entrepreneurship and education in sustainable energy. Ayre, M. (2007) ‘Will biofuel leave the poor hungry?’, BBC News [online], 3 October, http://news.bbc.co.uk/ 1/ hi/ business/7026105.stm (accessed 16 January 2012). Berridge, C. (2010) Hydrogen as a Fuel for Vehicles, PhD Thesis, The Open University. Boak, J. (2007) ‘CO2 release from in-situ production of shale oil from the Green River formation in the Western United States’, 27th Oil Shale Symposium, Colorado School of Mines, 15–17 October; also available online at http://www.ceri-mines.org/documents/ 27symposium/ papers/ ma15-1boak.pdf (accessed 16 January 2012). Brandt, A.R. and Unnasch, S. (2010) ‘Energy intensity and greenhouse gas emissions from thermal enhanced oil recovery’, Energy & Fuels, vol. 24, no. 8, pp. 4581–9; also available online at http://pubs.acs.org/ doi/ abs/ 10.1021/ ef100410f (accessed 5 March 2012). Concawe (2007) ‘Well-to-Wheels analysis of future automotive fuels and powertrains in the European context’, TANK-TO-WHEELS Report Version 2c, European Commission Joint Research Centre, March. CPL Press (2009) Biomethane for use as a transport fuel [online], European Biofuels Technology Platform, http://www.biofuelstp.eu/ biogas.html (accessed 26 March 2012). Department of Energy & Climate Change (2011) ‘2009 final UK figures’, UK Emissions Statistics [online], http://www.decc.gov.uk/ en/ content/ cms/ statistics/ climate_stats/ gg_emissions/ uk_emissions/ uk_emissions.aspx (accessed 16 January 2012). Department for Transport (2004) White Paper: The Future of Transport: a network for 2030 London, Cmd 6234, London, Department for Transport. Department for Transport (2012a) Biofuels [online], http://www.dft.gov.uk/ topics/ sustainable/ biofuels/ (accessed 26 March 2012). Department for Transport (2012b) Ultra-low emission vehicles [online], http://www.dft.gov.uk/ topics/ sustainable/ olev/ (accessed 26 March 2012). DieselNet (2011) Emission Standards >> European Union >> Cars and Light Trucks [online], ECOpoint Inc., http://www.dieselnet.com/ standards/ eu/ ld.php (accessed 16 January 2012). Dragone, G., Fernandes, B., Vicente, A.A. and Teixeira, J.A. (2010) ‘Third generation biofuels from microalgae’ in Méndez-Vilas, A. (ed.) Current Research, Technology and Education Topics in Applied Microbiology and Microbial Biotechnology(vol. 2), Badajoz, Spain, Formatex; also available online at http://www.formatex.org/microbiology2/chapters2.html (accessed 5 March 2012). Ecolane (2006) Life Cycle Assessment of Vehicle Fuels and Technologies – Final Report [online], March, http://www.ecolane.co.uk/ projectspublications.php (accessed 16 January 2012). Energy Independence and Security Act (2007) US Congress; also available online at http://www.epa.gov/ lawsregs/ laws/eisa.html (accessed 16 January 2012). Everett, B., Boyle, G., Peake, S. and Ramage, J. (eds) (2012) Energy Systems and Sustainability: Power for a Sustainable Future (2nd edn), Milton Keynes, The Open University/Oxford, Oxford University Press. International Energy Agency (1999) Implementation Barriers of Alternative Transport Fuels, IEA/AFIS and Innas BV. Linterink, N.E. and Bos, B. (2010) Passenger car CO2 emissions in tests and in the real world – an analysis of business user data, TNO Report MON-RPT-2010-001/14, Delft, the Netherlands, Dutch Ministry of Housing, Spatial Planning and the Environment. McGregor, R. (2007) ‘750,000 a year killed by Chinese pollution’, Financial Times [online], 2 July, http://www.ft.com/ cms/ s/ 0/8f40e248-28c7-11dc-af78-000b5df10621.html#axzz1lLGHiycH (accessed 3 February 2012). Mildenberger, U. and Khare, A. (2000) ‘Planning for an environment-friendly car’, Technovation, vol. 20, no. 4, pp. 205–14. National Atmospheric Emissions Inventory (2011) Air Quality Pollutant Inventories for England, Scotland, Wales and Northern Ireland: 1990 – 2009, Didcot, AEA Group. New Automotive Innovation and Growth Team (2009) An Independent Report on the Future of the Automotive Industry in the UK [online], Crown Copyright, Department for Business, Enterprise & Regulatory Reform, UK, http://www.bis.gov.uk/ files/file51139.pdf (accessed 16 January 2012). Nuffield Council on Bioethics (2011) Biofuels: Ethical Issues, London, Nuffield Foundation; also available online at http://www.nuffieldbioethics.org/ biofuels-0 (accessed 16 January 2012). Patterson, J., Alexander, M. and Gurr, A. (2011) Preparing for a Life Cycle CO2 Measure, report for the Low Carbon Vehicle Partnership, London, Ricardo/Low Carbon Vehicle Partnership; also available online at http://www.lowcvp.org.uk/ assets/reports/ RD11_124801_5%20-%20LowCVP%20-%20Life%20Cycle%20CO2%20Measure%20-%20Final%20Report.pdf (accessed 16 January 2012). Piock, W., Hoffmann, G., Berndorfer, A., Salemi, P. and Fusshoeller, B. (2011) Strategies Towards Meeting Future Particulate Matter Emission Requirements in Homogeneous Gasoline Direct Injection Engines, SAE 2011 World Congress & Exhibition, April, Detroit, MI. Potter, S. (2007) ‘Exploring approaches towards a sustainable transport system’, International Journal of Sustainable Transportation, vol. 1, no. 2, pp. 115–31. Potter, S. and Bailey, I. (2008) ‘Transport and the environment’ in Knowles, R., Shaw, J. and Docherty, I. (eds) Transport Geographies, Oxford, Blackwell. Renewable Fuels Agency (2009) About the RTFO [online], http://webarchive.nationalarchives.gov.uk/ 20110407094507/http://renewablefuelsagency.gov.uk/ aboutthertfo (accessed 14 February 2012). Riversimple (2010) The network electric powertrain [online], http://www.riversimple.com/ Content.aspx?key=f29e068d-82aa-4145-9e13-33d451027e02&mode=menu (accessed 26 March 2012). SMMT (2011) New Car CO2 Report 2011, London, Society of Motor Manufacturers and Traders; also available online at http://www.smmt.co.uk/ wp-content/ uploads/ SMMT_New_Car_CO2_Report_2011.pdf (accessed 16 January 2012). Stern, N. (2006) Stern Review: The Economics of Climate Change, London, HM Treasury and Cabinet Office. Teufel, D., Bauer, P., Lippolt, R. and Schmitt, K. (1993) OeKO-Bilanzen von Fahrzeugen (2nd extended edn), Heidelberg, Umwelt-und Prognose-Institut Heidelberg e.V. Thackara, J. (2010) ‘Is an Environmentally Neutral Car Possible?’, post in his blog on Design Observer Blogs [online], http://observersroom.designobserver.com/ johnthackara/ post/ is-an-environmentally-neutral-car-possible/ 22708/ (accessed 26 March 2012). TheBioenergySite (2009) UK Commitment to Anaerobic Digestion [online], 5M Enterprises Ltd, http://www.thebioenergysite.com/ articles/ 378/ uk-commitment-to-anaerobic-digestion (accessed 26 March 2012). U.S. Department of Energy (2011) ‘Biodiesel’, Alternative & Advanced Fuels [online], Alternative Fuels & Advanced Vehicles Data Center, http://www.afdc.energy.gov/ afdc/ fuels/ biodiesel.html (accessed 26 March 2012). U.S. Department of Energy (2012) ‘Emerging Alternative Fuels’, Alternative & Advanced Fuels [online], Alternative Fuels & Advanced Vehicles Data Center, http://www.afdc.energy.gov/ afdc/ fuels/ emerging.html (accessed 26 March 2012). Vehicle Certification Agency (2006) http://www.dft.gov.uk/ vca/ index.asp (accessed 26 March 2012).